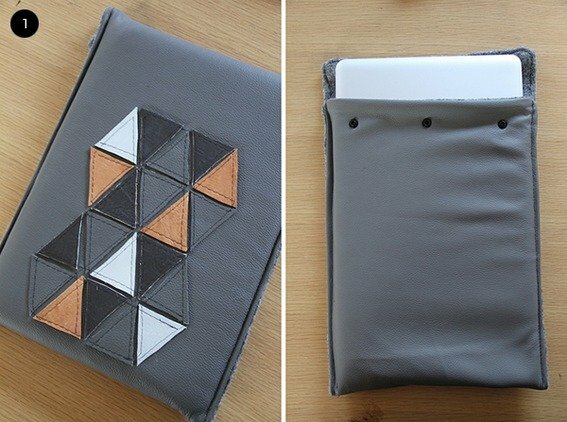 We've featured a few DIY iPad sleeves before, but I love the contrast of materials in this version. Plus, it's a fun way to re-use an old t-shirt! If you've got gadgets and gizmos aplenty, chances are they all need a little protection from the hazards of daily life -- or at least from surface scratches. Here are 20 creative DIY sleeves and cases for laptops and tablets! ...or wallet, or pencil holder, or mouse pad! Although I don't have an iPad, I've done my share of lusting over one. And if I DID have one, I would treat it kindly and whisper sweet nothings into its speaker. I'd also dress it in a protective, dapper sleeve when I wasn't fondling it.